Brett is currently in rehearsals for Mat Smart’s comedy NAPERVILLE which opens on Nov 20th at the June Havoc Theater. Brett’s playing T.C., the manager of a Caribou Coffee whose real passion is for the clarinet. Brett’s writing is currently featured in #SERIALS@THEFLEA. “Dance School: School for Dance” is entering Episode 9. The show follows a high school dance troupe who dance to the beat of their hearts. RULE OF is back! 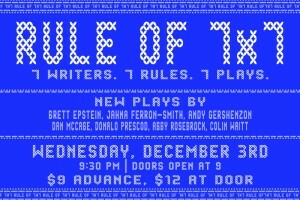 7 writers, 7 rules, 7 new plays. My rule is “DON’T. EVEN. GO THERE.” Obviously. Finally, Brett’s playing Joan Rivers in the Lust segment of the CUTTHROAT SERIES at the Flea. This is an honor. Because Joan is Brett’s idol.